Doom and Gloom: Sunspots, Volcanoes and Earthquakes. Famine, Disease and Pestilence. The problem with being merely human is, compared to the vast scales of planetary time, we are but brief and oh, so vapid bubbles. Our capacity to glimpse and somewhat comprehend the eons that have proceeded us, for the most part, only serves to frustrate and confuse. It is precisely because our brains, and by extension our minds, are geared with pattern recognition and pattern synthesis as built in survival mechanisms, that we valiantly strive to “make sense” of our world, our universe. Some make sense of their world by becoming artists, archeologists or doctors. Others become psychologist, biologist or astrophysicists. And some, eschewing any attempts to understand, keep it simple by “leaving it to god”. Others leave it to god, but hedge their bets with virgin sacrifices. This, if you think about it, has more in common with the scientific contingent. Reducing action to a simple experiment: A “What happens if ?” question. Where the scientist and the priest will sometimes differ, lays in which needs a definitive outcome. And which will keep trying to prove their ideas wrong in order to obtain a repeatable result. In times of heightened stress and uncertainty, it seems the desire to create order out of chaos becomes even more acute. If we were all roaming the savanna, keeping a wary eye out for cheetahs stalking in the tall grass, our actively engaged minds wouldn’t have time to parse out the minutia of conspiracy theories or end-time scenarios. Cheetahs are sometimes useful that way. As a species, we have been both blessed and cursed with the ability to invent time-saving processes and devices and implement them on a massive scale. And after all those processes and devices are firmly in place, what we are left with are active minds and a lot of free time. Here is where the Brain Squirrels tend to show up. Brain Squirrels are a side effect of attempting to solve problems and create contingencies with too little useful information. We end up running round and round in our heads, trying to make pieces from different jigsaw puzzles fit into a seamless whole; taking a piece of information here, a bit there with no regard for relevance. The end result is either a shoddy conspiracy theory or a series of valid questions we could do little about, even if we understood the problem and its answer completely. Why our weather is outside the norm. Why earthquakes happen. Why are there droughts and crop failures and starvation and so on. Sometimes though, if you sort through enough muck, you will find something useful. Something that allows you to mark an idea off your mental checklist and ponder contingencies based on known quantities, instead of hapless conjecture. So while I was poking around after the earthquake in Haiti, I made a few discoveries. Some people believe there is a link between the sun and our climate. No, I’m completely serious. Stop rolling your eyes. Yes, we are all aware that the sun warms the earth. We are also aware that the lack of sun cools the earth. But this idea is more subtle and more difficult to prove directly due to the aforementioned fleeting lifespan. We simply don’t have enough long term data to make a firm case. And, as yet, the causal link has not been discovered. So bear with me here, while keeping in mind that I am not arguing a case for or against human induced climate change, but am exploring the idea of links between solar activity, volcanoes, earthquakes and climate variation on Earth. Among the various influences on the Earth’s crust, from changes in weather to fluctuations in ice cover, the oceans are emerging as a particularly fine controller. Simon Day of the University of Oxford, McGuire and Serge Guillas, also at UCL, have shown how subtle changes in sea level may affect the seismicity of the East Pacific Rise, one of the fastest-spreading plate boundaries. So science generally accepts that changes in the climate have effects on volcanic activity and on the tectonic plates. If tectonic plates are affected, it seems reasonable to assume that earthquake activity is also considered under that heading. It is understood that volcanic eruptions spew micro-fine particles and other detritus into the atmosphere. This creates a sort of sun filter, cooling the earth by deflecting solar radiation and heat. That would, at least in part, account for the arctic cold snap covering the Northern Latitudes. What might account for the rest? Sunspots. Or more accurately the lack of sunspots. Note the inverse relationship between the charts further up the column and the one shown here. According to them that study our friend the Sun, we are right at the bottom of what is known as a Solar Minimum. A Solar Minimum is defined as a time in the Sun’s regular cycle with little or no solar activity. The longest minimum on record, the Maunder Minimum of 1645-1715, lasted an incredible 70 years. Sunspots were rarely observed and the solar cycle seemed to have broken down completely. The period of quiet coincided with the Little Ice Age, a series of extraordinarily bitter winters in Earth’s northern hemisphere. Many researchers are convinced that low solar activity, acting in concert with increased volcanism and possible changes in ocean current patterns, played a role in that 17th century cooling. NASA scientists have also noted that the more calm the Minimum, the more quickly the Sun’s systems return to an active state. 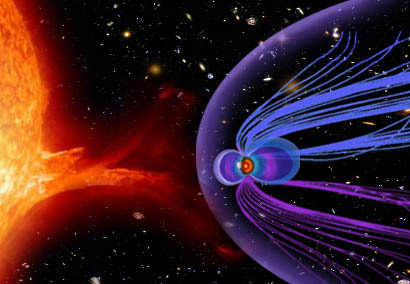 In addition there are a larger number of strong disruptive events, like solar flares. I began by looking at a geology sites on the internet to find some information on earthquake strength and frequency after they Haiti quake. 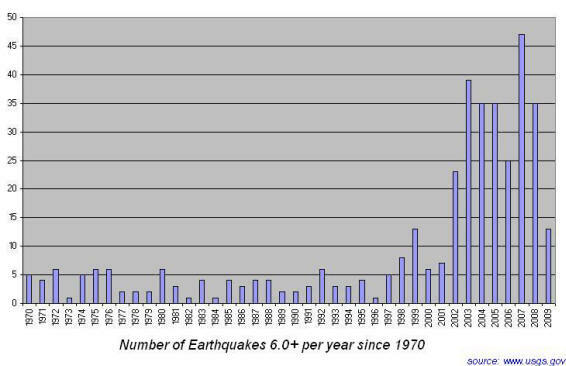 Based on forum postings, the question of earthquakes and sunspot activity comes up whenever there is a major quake. And instead of addressing these concerns, the regular posters flatly and adamantly denied any direct causal link between sunspots and earthquake or volcanic activity in the usual dismissive manner of the pseudo-skeptic. Since I’m not a fan of flat denial as it has very little to do with critical thinking, I decided to look into the question for myself. After further reading I wondered if the “skeptics” on the geology boards would be willing to admit the possibility of an indirect causal link. A chain reaction, if you will. I discovered a site with information on a rather interesting theory. On the site M.A. Vukcevic has a formula that discusses the interaction of influence on the mass of the sun from the magnetospheres of outlying larger planets. 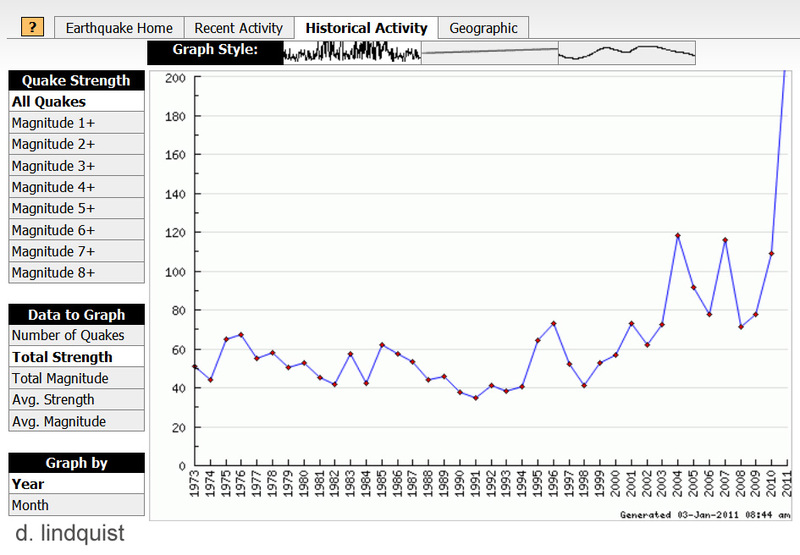 This chart shows the correlation between the movement of planets Jupiter/Saturn and the incidence of recorded sunspots. A PDF further discussing his work. If the Sun’s mass is affected by these planetary magnetospheres, wouldn’t that suggest it is possible that the Earth’s mass, the molten core which helps to drive its magnetosphere would be affected too? In the end, what I am suggesting is not a simple cause and effect. Instead I’m suggesting like many systems with interlinking chaotic processes, it’s a complex and dynamic cause and effect. * Reduced sunspot activity due to planetary effects can affect how much heat the Earth receives. This begins to shift weather patterns, which in turn affect the tectonic and volcanic systems of the planet. * The magnetospheric effects working on the Solar mass are echoed in our molten planetary core resulting in increased volcanic and tectonic activity which results in further change in the planetary weather system. NASA scientists may not agree with Mr. Vukcevic. I have no idea whether his work is valid or supported. But the scientists at NASA do agree that sunspots, earthquakes and volcanoes are linked in some fashion. At this point they are not willing to forward a hypothesis about the correlations but agree that they are mediated by changes in climate. Whether this goes toward supporting claims on either side of the global warming vs. global cooling debate is outside my area of interest at the moment. It is certain that the recent Arctic blasts which affected much of North America, has already impacted food security in the United States. While this, in and of itself, does not constitute a food crisis, the truth is many people are not the position to afford an increase in food prices. It is more along the lines of “Another straw on the camels back”. If there is a possible link between sun cycles and an increase in deadly earthquakes, volcanoes or weather changes then we are obligated to explore those ideas. Haitians and others across the globe who have been adversely affected by these terrible tragedies are a stark testament to how little we know and how much we need to discover about our world. Climate Change May Trigger Earthquakes and Volcanoes.